A psychedelic assault on the senses in the very best way possible, Lorenz Wunderle’s blistering tale of loss, pain and vengeance will grab you between its animated teeth and shake you senseless. 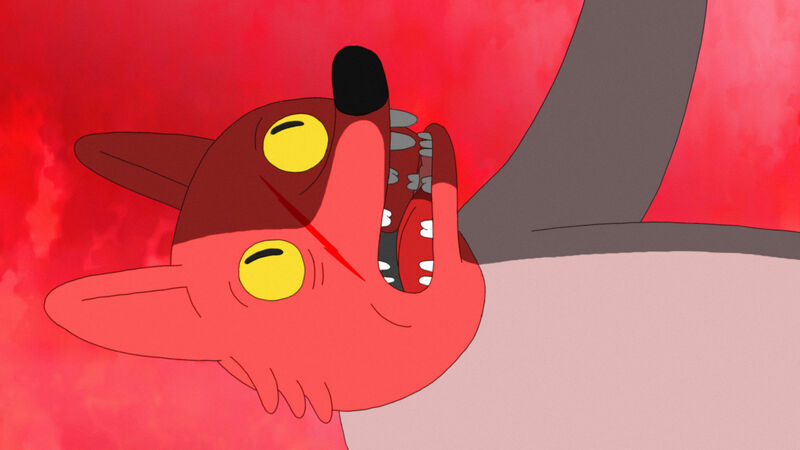 The story of a coyote tormented by fear, anger and grief after his family is attacked by wolves, DN spoke to Lorenz ahead of the film’s second London Film Festival screening about using bold and uncompromising animation to explore the turmoil of human emotions and the savagery of violence. 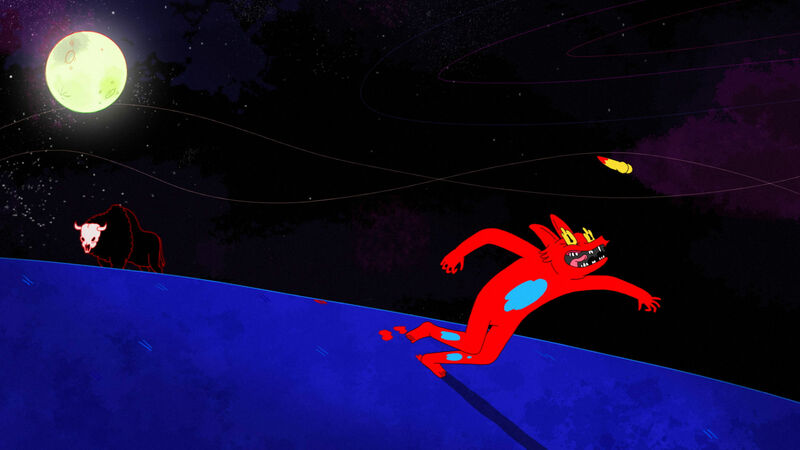 How did you come to join forces with animation studio YK to make Coyote? YK Animation Studio had already existed for 4 years when I pitched my idea for Coyote. I had heard from a good friend, that YK were ready and interested to produce new film ideas from other people outside their studio and I felt that they were the only producers in Switzerland that would have the same taste as me, that they would be into Coyote and support me. What was the inspiration behind this full-throttle tale of loss, despair and vengeance, and how did the story evolve from there? I was inspired by so much TV animation, movies or comics from my past. I grew up with a lot of Hollywood action movies from the late 90s that were all about good versus evil, betrayal, vengeance and violence. And I loved Looney Tunes and Tom & Jerry as a kid (I still do today). So fictional violence on TV was for me fascinating. Although Tom & Jerry was not bloody violence, they still hurt each other in a funny and entertaining way. So my interest was to create a character who is getting pushed aggressively into a corner that he can only break out from with violence. So his violent action in the story should be a cathartic moment. I was also fascinated by mythological figures and religions like Voodoo or Santeria that are about existing parallel worlds. So I created this demon that wants to make a deal with the Coyote and also pushes him to the violent action in a world that the Coyote could physically and mentally do. Coyote isn’t at all shy in its depiction of violence. Did you have any concerns about creating such a brutal story? I think the savage violence in Coyote is not just senseless, it makes sense in this story and in the development of the character. Some friends had concerns about the bloody scenes and the violence but I was confident that this was a storytelling style in animation that would make some waves in the festivals. I knew that other friends would love to see this film when they saw my teaser for Coyote. And I thought, if I love it and wanted to make it and some friends would love to see it, then other people would love to see it as well so I shouldn’t tone down my idea just to be sure that everyone would ‘somehow like’ Coyote and it become ‘greyish’. I felt that I would make a film that you love or hate to watch. So I was clear that some people are not going to be into my film and that’s ok for me because I don’t make films for them, I’m making these types of films for people that have the same tastes as me. I felt that I would make a film that you love or hate to watch. The film employs a very bold style and colour palette. What references did you draw from to build its distinctive look and how was that further shaped by the narrative? 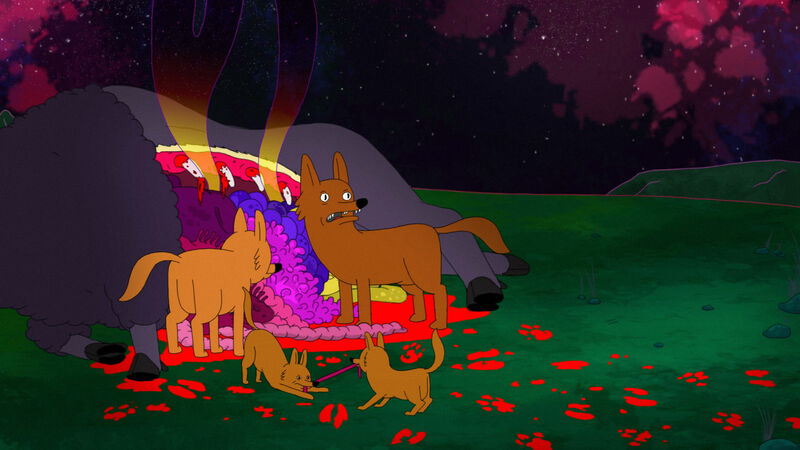 I drew inspiration from Adventure Time and I was also interested in using complementary colour palettes in my scenes, commonly using red to green or warm to cold colours. I also wanted to have the colours saturated in contrast to the nighttime in the film, to have a trippy and unrealistic effect. The colours show the different worlds that the Coyote is going through. Also, I used the common emotional suggestions of colours. For example, blue for suggesting sadness or depression. Black or violet for death and red for life or aggression and so on… but that’s subjective for each person. Could you tell us about your animation processes and the tools you used over the 11-month period it took to create Coyote? I was mostly thumbnailing the story and picked up the images that I wanted to be important and evolved it again from those favourites. After that, I made an animatic and then a teaser to explain what kind of feeling the film should deliver. I took a break from my idea and worked as an animator on different films for other friends in Switzerland. A year and a half later, my producer and I worked on the storyboard again and the animatic. So we produced Coyote with pre-production, animation and post-production in 11 months but I was working on the idea on and off for maybe 2 years. It felt very healthy for me and for the work. Softwarewise we used TVPaint for the animation and for the post-production Adobe After Effects and Premiere. Coyote seems to have made a splash on the festival circuit, racking up a stack of screenings across the globe. How have audiences been reacting to the film? Do they engage with the film’s deeper themes? I got a lot of positive feedback and I felt in some of the Q&As that the audiences were getting the deeper themes in Coyote. I was totally amazed by the interest, I’m really thankful and happy about that. I rarely sit in the audience but when I did, I saw some people shaking their heads in certain scenes they didn’t like but as I said before, I’m totally OK with the honest reactions. So it’s not their film, I get it! At the same time, there were other people who loved it. It’s somehow funny to me but also honestly, I’m really happy and relieved to know that there were fans of Coyote at the festivals. What will we see from you and YK next? A lot of other animated short films of course and we hope to do a series soon. Subscribe to the Directors Notes podcast to hear our LFF filmmaker interviews. You can also catch up on all our coverage from the London Film Festival here. Thank you for this insight into Wunderle’s talented mind. His creation opens the eyes to what animation really can offer a new. How internal nightmares can look when developed into something entertaining, frightening and a fresh breeze. Glad you enjoyed the interview Geoff, it really is an astounding piece of filmmaking. Thank you again, MarBelle. Love the site as a whole. Really useful and entertaining.